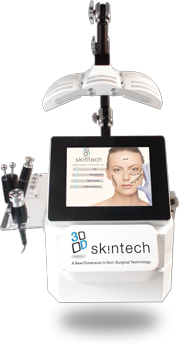 3D Skintech offers Rotational Diamond Peel Microdermabrasion, Radio Frequency Skin Tightening, Mesotherapy, and LED treatments that are combined together or used as a stand alone treatment to offer the most effective treatment for a specific skin type or areas of concern. Microdermabrasion is a non-invasive mechanical exfoliation. It is used for facial rejuvenation and removal of the top layers of the stratum corneum (surface layers of epidermis) to improve the appearance of skin. Our Diamond Peel Microdermabrasion is the most effective and safest form of microdermabrasion on the market as it contains no products and leaves no residue on the skin and is completely pain free. The Diamond Peel polishes the skin and dead skin cells are removed and buffed away via the vacuum suction. Congestion and blackheads are drawn out as blood and oxygen to the skin is stimulated thus regenerating the skin. Ideal for ageing skin, fine lines and wrinkles, sun-damaged skin, pigmentation/uneven skin, brightening up the skin and reducing blockages and congestion. Treatment is also suitable for treatment of back, chest and hands. This treatment focuses in on an area of concern on the face or neck that collagen loss is present to help tighten the skin and reduce lines and wrinkles. Skin Tightening uses a Focus Fractional Radio Frequency energy that is heat induced to penetrate deep down into the dermis of the skin causing the contraction of collagen fibres to get an immediate plumping effect but also increases synthesis of new collagen and elastin fibres and assists product infusion. Collagen takes 14-21 days to synthesise therefore results can be seen in the 3rd/4th treatment. The tightening and lifting effect works well on foreheads, double chins, around the eyes and around the mouth. Is a non-invasive method of trans-dermal skin delivery. 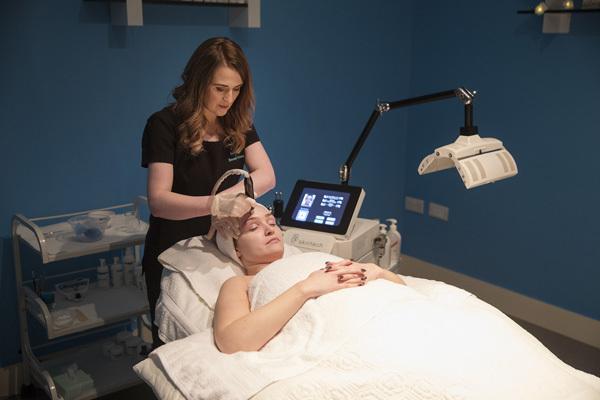 Traditionally this treatment was applied with needles but with our new technology we use an electrophoresis energy to penetrate active ingredients deep into the skin cells. This allows the most effective application by increasing the cutaneous permeability specifically in the stratum corneum to increase hydration, lighten the skin or deliver anti-ageing ingredients to promote collagen and elastin production. 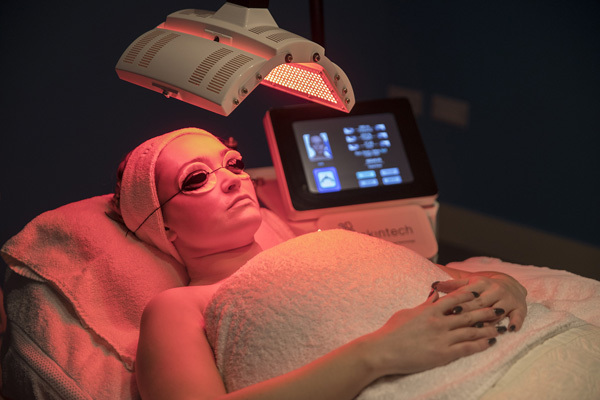 LED is an non-invasive safe method of light therapy that stimulates the skins natural repair. LED stands for Light Emitting Diodes developed by NASA which uses specific colour wavelengths of light that penetrate the skin at varying depths to help correct specific skin conditions. Our technology uses a canopy of 4 different LEDs; Red, Yellow, Green and Blue which is combined with the other technologies or can be used as a stand alone treatment. Red is used to increase collagen synthesis, lift and tone the skin. Yellow helps to calm the skin boosting immunity of the skin. Blue works on acne, killing the bacteria that causes it. And Green reduces pigmentation in the skin and aids skin regeneration. This is a non machine based skin treatment for under 16 years of age to introduce them to skin well-being where the therapist will educate the teens on how to look after their skin along with a mini facial. A stand alone treatment to remove the top layers of sun damaged and dead skin cells using the new advanced Diamond Peel surface to smooth out the top layers of skin followed by 3D Skintech’s Vitamin C mask to brighten, hydrate and firm the skin. This facial benefits dull, uneven or sun-damaged skin, congestion or blackheads, fine lines and wrinkles, ageing skin or dry skin. A light technology that helps the skin to repair itself by delivering specific amount of light energy to the skin to reestablish itself with 4 LED colours Red, Yellow, Blue, & Green. This treatment is incorporated in to the Skintech facials or can be done as a stand alone treatment every 4 days. This advanced facial includes all four sections of the 3D Skintech technology (Diamond Peel Mircodermabrasion, Radio Frequency Skin Tigtening, Mesotherapy & LED treatment) to help minimize fine lines and wrinkles, skin regenerating, and controls irregularities of the skin. This 90 minute treatment minimizes fine lines and wrinkles by increasing the synthesis of new collagen and elastin fibres giving a lifting effect and contours the face. This is followed by 3D Skintech’s hyaluronic mask with the red LED treatment to stimulate collagen. A consultation is required prior to the facials.